As a city formed by two rivers, boats are important to Lyon. Many visitors to Lyon arrive via river cruisers, and you'll often see quite a number of these large boats lined up along the Rhône. 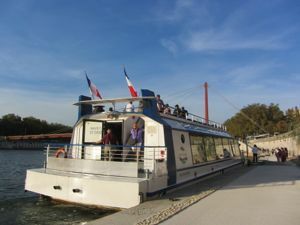 For those who would like a shorter experience on the river, Lyon City Boat offers a couple of different one-hour cruises. These cruises leave from the Quai des Célestins (map) on the Presqu'île. Note: Although a cruise is included in the Lyon City Card, you must present your card at the ticket booth on the Quai, just at the end of the Passerelle du Palais de Justice, to get a boarding voucher. The Promenade Découverte autour de l'Île Barbe goes north on the Saône and makes a circle around the small Île Barbe. Site of a 5th century abbey and said to be a favorite spot of Charlemagne, this island today contains private properties as well as an inn and restaurant. Commentary in French and English points out the major sites along the route. The Promenade Insolite au coeur de la Confluence goes south on the Saône and then north on the Rhône, past the new urban area of the Confluence. In the summer additional cruises are offered in the mornings and evenings. Check with the Tourist Information Office for specific routes and schedules. Because many of the sites of touristic interest in Lyon are in a fairly compact area of the Presqu'île and Vieux Lyon, the boat tour offers an easy and comfortable way to see some other areas of the city. One fun bit of information I learned on the boat tour: the name bateaux mouches, which is both a specific company and a short-hand for boat tours on the Seine in Paris, comes from the fact that the first boats were made in the de la Mouche quartier of Lyon. However, in the 1950s, a great "poisson d'avril" or April Fool's joke, put forth the story of Jean-Sébastien Mouche, the purported inventor (with the agreement of the Bateaux-Mouches company). In fact, the company today has named its flagship boat the Jean-Sébastien Mouche! Above, Lyon City Boat at the Quai des Célestins. 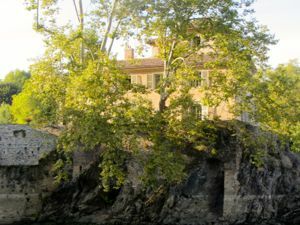 Below, View of l'Île Barbe from the boat.